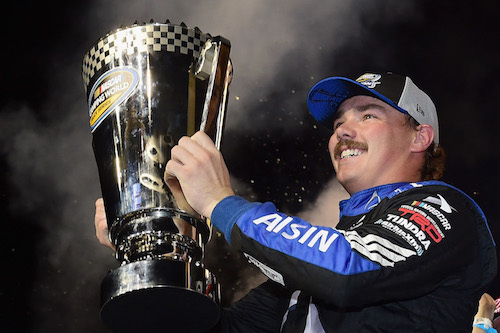 On Nov. 16, Brett Moffitt was celebrating a NASCAR Camping World Truck Series championship after winning the 2018 season-finale at Homestead-Miami Speedway. Fast forward to Dec. 5, and he was notified he had lost his job as driver of the No. 16 Hattori Racing Toyota in favor of a driver with financial backing, according to a report from Autoweek. Moffitt won six races in the 23-race 2018 Truck Series season, including the final two races of the year at ISM Raceway near Phoenix and Homestead-Miami. Those are the only six wins for the team that was in its second full season of Truck Series competition. Moffitt also posted 13 top-fives in 2018, his only season as driver of the No. 16. Hattori Racing struggled, financially, throughout the 2018 season, despite success early. Moffitt won the second race of the season at Atlanta Motor Speedway, but the race team struggled from week to week, not knowing whether or not it would make the next race. At the start of the season, Hattori Racing didn’t plan on running the full schedule, and Moffitt signed only a four-race deal, but his success kept the team going for the duration of 2018. The race team has yet to announce Moffitt’s replacement. Moffitt is unsure of the specifics of his racing future. Moffitt will be celebrated as the 2018 Camping World Truck Series champion Saturday evening in Charlotte during a joint banquet for the Truck and Xfinity series.